Whew, what a week. My district is moving forward with the creation of a district Facebook and Twitter page with the purpose of sharing positive news about our students, teachers, and schools. It is not live yet, as we meet to work out some of the finer points, but I am excited to be a part of our district taking this step. Throughout this past week I have come across numerous resources for Math, Science, Social Studies, and English. Instead of sharing just one or two, I want to share all that I have found. It was a slow week for Math, but not for the other subjects. Hopefully you can take some back to the teachers in your school or district. 1.) Mathademics is a YouTube Channel that provides videos for several different content areas in mathematics. From simple multiplication to Algorithms. This would be a useful site to share a concept before you might be teaching it. 1.) Everyday Mysteries is an interesting site for learning about fun science facts. How does stuff work? Why does this happen? This site aims to answers several of life's most interesting questions. 3.) Online Labs is a site for Science Teachers to find science simulations for Biology, Chemistry, and Physics, among other science subjects. The site has a huge list to search through, so spend some time finding something you might be able to use for subject matter you will be teaching soon. 4.) Anatomy Corner is a site dedicated to resources for teachers and students that focuses on Human Anatomy. Information is broken down by subject matter as well as several galleries. 5.) 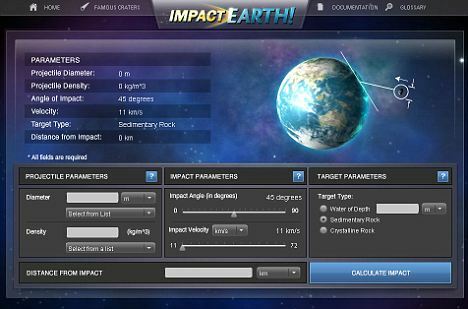 Impact Earth is a simulation created by Purdue University that allows students and teachers to predict the impact of a asteroid hitting the earth. You can choose the size, density, velocity, angle, location of impact, and distance from impact. The simulation will then provide data to help determine the extent of the damage. What a fun site for Earth Space Science. 6.) Science Daily is an online magazine/newspaper that has tons of articles, images, videos, and resources that can be used by teachers and students in the classroom. You can search the site by various subject matter and find some great documents to use in the classroom. 1.) iCivics is a site dedicated to teaching civics. They have tons of resources, interactives, and simulations to learn about American Government. There are also several games that students can play to learn about supreme court cases, the branches of government, and citizenship. There is also a dedicated page for teachers. 2.) 60 Years of Tension is a site dedicated to learning about the Korean War and its aftermath. I never really got to teach this era of U.S. History, but this site offers tons of useful information worth examining. 3.) Teaching American History offers tons of resources and primary documents for teachers to use when teaching American History. There is also a section dedicated to lesson plans for teachers to use in the classroom. You can search for documents based on time period as well. You can also find audio of lectures and information on summer institutes for educators. 4.) TargetMap is a site that allows user to create their very own data maps. This site could be very useful for teachers who want kids to graph their own data for a research project. I always had my kids do different activities with maps, but this site would take those activities to a whole new level and allow them to easily graph data that they research and create professional looking maps. You will need to create an account to use this service. 5.) Show World is a site dedicated to showing statistics and data for countries around the world in a unique way. When you choose a data set, the countries change size to represent the amount of data that you are looking for. It is a neat perspective on information for world statistical data. 6.) Mapeas is a site dedicated to showing recent news in a whole new way. You view the entire world. For every number in a circle you see are the number of news stories in that area of the country. The news stories are then broken down into Sports, Entertainment, Business, Science, and General. Be a great way to introduce students to current events. 7.) Rag Linen is a site dedicated to an online museum of the 25 first American newspapers. For these newspapers you can find various resources to use in the classroom. These would make great primary documents in the U.S. History classroom. 8.) Cambridge Brain Sciences would be a great resource for Psychology teachers. The site offers quizzes for students to take to learn about the cognitive and memory abilities of their brain. The results provide valuable information to students about how they learn and why they might learn the way they do. 1.) Digital Is is an aspect of the National Writing Project. The website is a collection of ideas, reflections, and stories about what it means to teach writing in our digitally connected world. Highly recommend sharing with teachers so they can see the changes taking place as it related to writing for students. 2.) Road To Grammar is a site that offers quizzes that students can take to improve their grammar skills. There are also several games and downloads that students can access as well. A very promising site for ESL and ELL students. 3.) The Online Books Page is exactly what it sounds like. It is a site from the University of Pennsylvania that contains hundreds of free books online. You can search by Author, Subject, Title, and Serial Number. There are over 800,000 books listed on this website. Well worth checking out. 4.) Blio is a free eReader that you can download. It has access to over 1 million free books online as well as books that you can purchase. It has finely gone live since the last time I did a Blog Post about Blio eReader back in February of 2010. Well worth looking at if you think you might enjoy reading books on your laptop.